It is my belief that anyone using proper technique from 30 feet should be able to throw a ringer every time. Constant 6 — The Stride. None! If you are a 30 foot pitcher there should be no reason to stride. This constant was the toughest to solve. The difficulty was being able to pitch a horseshoe under control, without a stride. It was apparent that I needed to strengthen my shoulder, legs and core to eliminate the stride and maintain my balance throughout the delivery from a stationary stance. In 2008 I began this blog. It was an effort to chronicle my struggle to find “My Way”. It started with a frustrating first night of pitching horseshoes in an American Legion league. I had zero ringers in three games with 108 attempts at throwing one. My blog now covers 8 years of the search. It has been a fruitful, yet, sometimes frustrating search. My goal has always been, “constant” improvement. Sometimes there are obstacles that interfere with this goal. I’ll cover those as we proceed through this paper. This article, which will become Part 50 of my blog, will describe a method that I don’t think I can improve on, and eliminates those obstacles. As a computer programmer for 35 years, I felt the key to success was the establishment of constants, and the reduction of variables by changing them to constants. In simple terms, it would be like taking my left foot position at a precise location on the approach every time. As an example, I cited the use of dots on a bowling approach which are used to set your feet properly, prior to striding forward. This would be considered your constant. You would “constantly” set to this dot every first ball. So, I set out to change every variable to a constant. I broke down the art of pitching horseshoes into it’s various parts. The result was Part 4 of my blog. I ultimately established the Line of Flight (LOF), Visual Alignment Point (VAP), Pendulum Swing, Drop Angle, Launch Angle, Back Swing Stop Point (BSSP), Alignment Point (AP), High Point of Flight, and the use of the Center of Gravity of the horseshoe. All described and referenced many times in my blog. At the beginning in 2008, I pitched a single turn from 40 feet. Actually, a single turn or rotation was “natural” for me, as a carryover of my method of bowling as a young duckpin bowler. I would take the typical flip grip and turn the horseshoe one complete revolution. I was not yet pitching from 30 feet, but, the time was coming, sooner than I expected. A knee injury made the decision for me and my 70th birthday in December qualified me to switch to the Elder Class and pitch from 30 feet. This move up to 30 feet became both a blessing and a curse. I caution those considering the move up to 30 feet to understand all that that entails, both pro and con. Women pitching from 30 feet already face some of these challenges. I will cover some of them throughout this paper. A couple of photos later will help to define those obstacles and a little additional information finishes this paper. I had noted that 40 foot turn pitchers, when moving up to 30 feet, did not move all the way up on the approach. I personally couldn’t see giving up distance just to continue turning the horseshoe. Perhaps if I had been throwing the turn for 10 or 15 years I would have been reluctant to make the change. I tried a variety of flips and turns, i.e., 1/3 turn, 3/4 turn, 3/4 reverse, 1-1/2 flip, flip-turn, and single flip. I settled on the single flip with Snyder EZ Flips and took full advantage of the 30 foot shorter distance. By the end of 2010, my ringer average had reached a tad under 60%. I began pitching in the Pro Tour events along with most of the NHPA tournaments in Maryland. Continued improvement has always been my goal and I was not continuing to improve. I am basically at the same ringer average as I reached in 2010. It didn’t take long before I realized that there were many times when I simply could “not” use my normal constants on the approach, such as the positions for my feet, or taking a normal stride. I simply had to find, “My Better Way”. It has been a fruitful, yet, sometimes frustrating search. As mentioned, my goal has always been, “constant” improvement, both literally and figuratively. The one constant that seemed to elude me, which I mentioned above, was the “no stride” delivery. I tried a variety of stances, left foot forward, martial arts stance, feet parallel to the stake, using the left approach or right approach. I just didn’t seem able to maintain my balance when swinging from address to back swing and forward swing to release. I simply needed the stride to give me the impetus to throw the shoe under control the 27+ feet. I continued to visit my local gym 2-3 times per week and decided to try to strengthen the muscles of my shoulders, specifically for pitching horseshoes. I threw in a couple of exercises at the cable deck that simulated the swing forward from back to front. 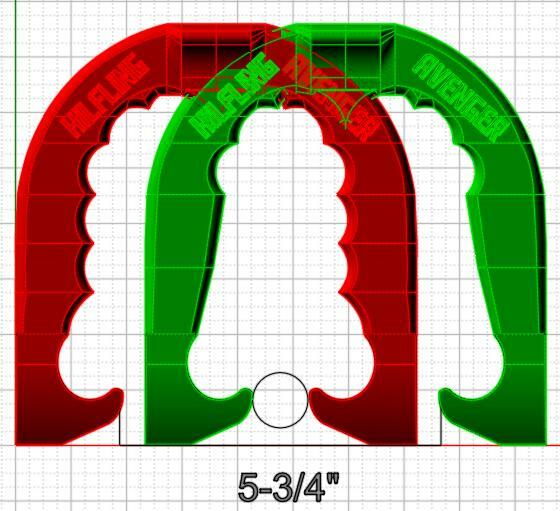 During this time I was continuing to design horseshoes, primarily for the flip pitcher. I was able to design horseshoes that had symmetrical hook caulks that permitted the horseshoe to be turned or flipped with thumb caulk up or down. One such horseshoe was the Patriot. In August this year, I began experimenting again with the 1-1/2 flip with the Patriot and much to my surprise…it worked. I had used the 1-1/2 flip with Snyder EZ Flips in 2008 for a short time. I switched full time to the 1-1/2 flip with the Patriot prior to the Maryland State Singles. I had a couple of games in the 72% percent range and won a second place in the Elder Class. I also used the 1-1/2 flip to win the Maryland Senior Olympics in my age group. My ringer percentage was even better in that event. I was using my normal stride in both events, as they both had permanent concrete approaches. Recently, I had a case of shin splints, swollen ankles and a bone spur that made it painful to stride forward on the approach. My only option…the no stride or stationary stance. This gave me an opportunity to combine changes in setup, alignment and grip to produce what I consider the “proper technique” for me, which I mentioned in Part 4 written back in 2008, and mentioned in the first sentence of this article above. There are 3 aspects to this method. They are the grip, stance and body alignment while standing at the 27 foot foul line. It all starts with the Pendulum Swing which swings down an imaginary line called the “Line Of Flight”. The LOF defines the directional line which the horseshoe needs to follow to insure a straight line flight at the stake at release. When practicing, it is a stretchable cord that goes from the stake to the approach. When I take my stance, I want the Center of Gravity of my horseshoe to be directly over that LOF. The LOF, Pendulum Swing and Center of Gravity are all constants. Let’s start by defining the Pendulum Swing. You can think of the Pendulum Swing as swinging your arm like the pendulum of a grandfather clock. In general, the pendulum is a straight shaft without joints and terminated with a weight. It swings in a straight line from left to right without deviation. Further, at rest it hangs straight down vertically and perpendicular to the ground. Can you swing your arm like a pendulum? Absolutely. See Image 1 below. Think of the hub as your shoulder, the shaft as a fully extended arm, and the weight as the horseshoe. It is fairly easy to determine when your arm is hanging vertically downward. First, extend your arm fully without bend at the elbow. Step to a door jamb and touch your shoulder to the jamb and also touch the back of your hand to the same jamb. When they’re both touching, it’s vertical. From this position pay attention to how far the hand is away from the leg. 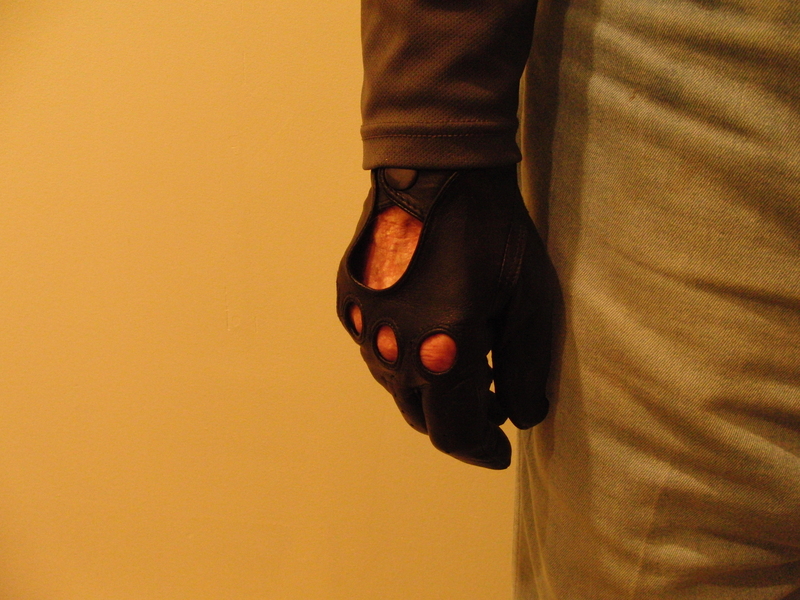 You’ll use this hand location when we discuss the Natural Grip. The wheel on the right in Image 2 below, demonstrates that a horseshoe released early or late is still on line if your arm swing is down the line. The wheel on the left, which is rotated off line slightly, demonstrates that a horseshoe that is released off line early, may be to the right while a horseshoe released late, may go left. Please note the implication of this graphic. The wheel is turning at a constant rate. A horseshoe released early goes shorter than a shoe released later if the rotational speed is constant. If a horseshoe is blocking your way, it is only necessary to release later, without additional effort using your normal arm speed. There is no need to throw the horseshoe harder to arrive higher. The Natural Grip begins from a normal stance. Photo 1 below shows my normal stance with right arm relaxed with my thumbs turned in toward the leg. The distance your hands hang naturally relative to your leg, is dependent on the width of your shoulders. The size of your lats and triceps will also play a role in how your arms hang. The Natural Grip is a grip that can be taken that maintains your normal arm hang. The typical flip grip doesn’t do it. Photo 2 below shows that the relaxed arm when fully extended, continues straight down and does not swing out away from the body. 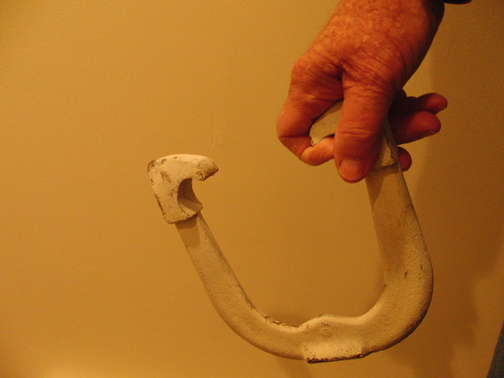 The act of swinging a weight (horseshoe) will cause the arm to straighten slightly by way of centrifugal force. 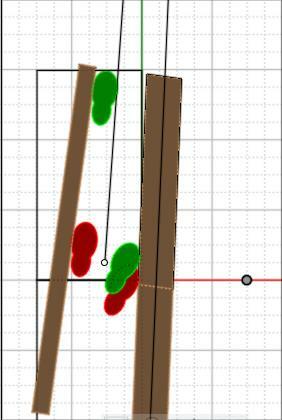 It is important that the swing arc does not deviate by swinging off line. A pendulum swing offers the best method to remain on the Line of Flight and remain close to the body and vertical. In Photo 3 above, the horseshoe is gripped with the typical flip grip. Normally, the hand is rotated clockwise and the thumb is about 3-1/2 inches to the right of the leg. The rotation of the palm clockwise causes the right elbow to turn inward toward the body and the hand moves away from the leg. As the arm extends due to centrifugal force the straightening of the arm pushes the horseshoe even further to the right. Your arm is no longer in a straight line and vertical. It is difficult to keep a horseshoe going straight down the LOF, if your arm is not hanging straight down and vertical. The tilted arc that occurs, will produce erratic results depending on where the horseshoe is when released. Think of how difficult it is to hit a golf ball straight down the middle when swinging the club on a tilted plane. If you hit the ball early, it’s leaving to the right, hitting late leaves to the left, either generally with an unwanted spin. If your swing arc is vertical and down the LOF, the worst that can happen is the horseshoe will arrive too short or too long. However, your direction will be correct. You only have about 5-3/4 inches to work with, relative to the stake, to throw a ringer. You only need to be about 3” to the left or right to miss a ringer. If you take the typical flip grip and rotate your hands all the way into the palms up position, it is virtually impossible to dangle your arm in a straight line and vertical. The problem is the rotation into that position causes the elbow to rotate further inward toward the body and causes a larger angle and tilted plane away from the body. Unfortunately, it’s just the way your arms normally work. Photo 4 above shows the 1-1/2 flip grip with fully extended arm. Note the similarity between the relaxed and extended arm in Photo 2. Basically, this grip does not alter the location of the hands and horseshoe from the relaxed position without horseshoe. Now, compare this hand position relative to the leg that is shown in Photo 3 when taking the flip grip. There is no unnatural arm rotation with the 1-1/2 flip grip as compared to the arm rotation needed with the normal flip grip. 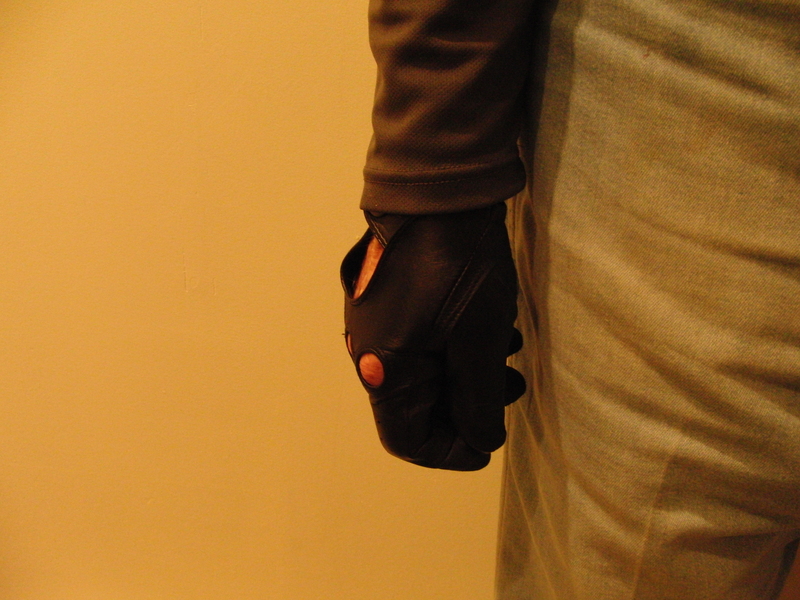 In Photo 4, I am gripping the Patriot. The Patriot has neutral hook caulks which are symmetrical on both sides. I prefer to use the 1-1/2 grip with the thumb caulk up. This causes the thumb calk to hit the ground first, as I normally over-rotate the shoe slightly and hit the back end first. This tends to slow down the forward movement of the horseshoes as it arrives at the stake. I would rather have the back end hit first and scoot forward rather than hitting the hooks first. It really is a personal choice, you can just as easily grip with the thumb caulk down. 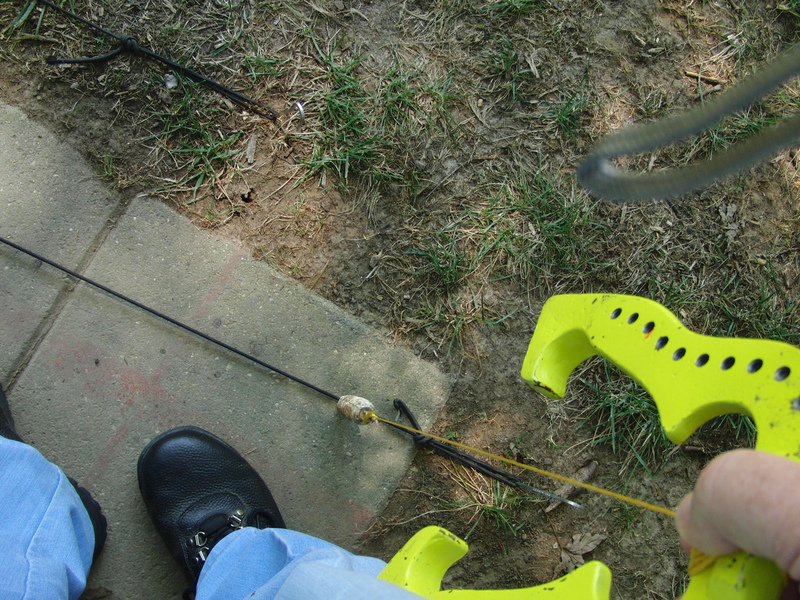 The arrow shown in Photo 4 passes through the Center of Gravity when the horseshoe is dangled from the hook caulk. The horseshoe will try to rotate back to it’s normal rotation, around the center of gravity. This adds a little additional rotational force when it hits the stake. This is similar to a turning shoe. This unsquare and rotational arrival helps reduce the loss of ringers when coming in too square and bouncing straight back. When I used the traditional flip grip and release, I was always fighting an early release and short shoe as the traditional flip grip is more of a pinch grip between thumb and finger. If you try the hook caulk grip you will immediately feel you have much better control and feedback for the proper release. There is “no” slipping out of the fingers during the forward swing, as happens when the thumb caulk is slippery when pitching in wet clay. You will find that it is much easier to clean off the single hook caulk, as opposed to cleaning the thumb caulk area. Photo 4 shows the horseshoe perpendicular to the leg at setup, which should continue to horizontal at address, and back to perpendicular to the leg as it passes on the way back to the Back Swing Stop Point. The orientation of the horseshoes should not change throughout the swing back and forward to release. Rotating the horseshoe very slightly clockwise when resting against the leg seems to give me a bit stronger grip feeling, but, I must concentrate to maintain that slight rotation throughout the swing. When I raise the horseshoe to the address position with that slight rotation has the left shank of the shoe slightly higher then the right. This slight rotation seems to extend my arm further and retains the extended arm fully. 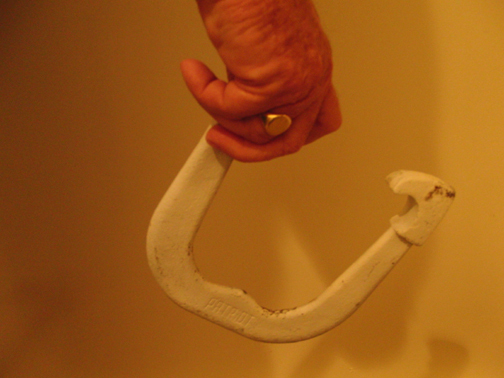 Photo 5 above shows the horseshoe dangling from the hook caulk. I pitch with gloves and I am showing the grip positions without gloves for clarity. 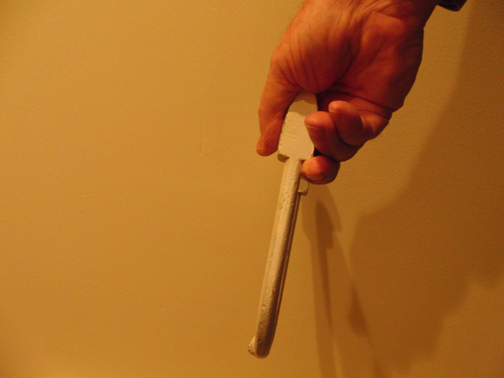 The grip is taken by simply placing the thumb on top, closing the index finger and wrapping the middle finger behind the hook with the tip of the middle finger locking onto the back of the hook caulk on the underside of the shoe. 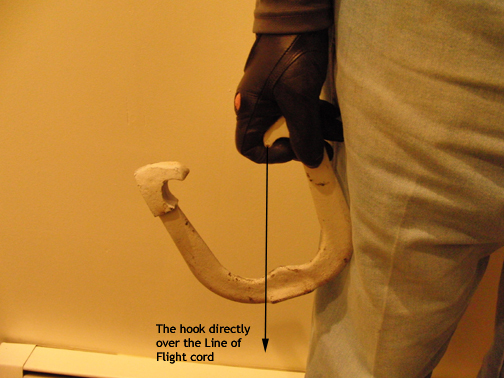 The point of the hook caulk is supported and locked into the area at the base of the thumb. See Photo 6 and 7. Photo 6 shows the completed grip. Check out Photo 4 to show the grip taken showing the normal setup position with the horseshoe against the leg. Resting the horseshoe against the leg is an important constant with this method. Not only is it the starting position, but, it’s the position to be repeated as the horseshoe is returned during the back swing and actually ticks the pant leg going by. This is also an audible constant and confirms that the horseshoe is still over the LOF. Photo 7 above shows the side view of the completed grip. Note the location of the middle finger behind the back side of the hook caulk. Also note the location of the point of the hook caulk at the base of the thumb. 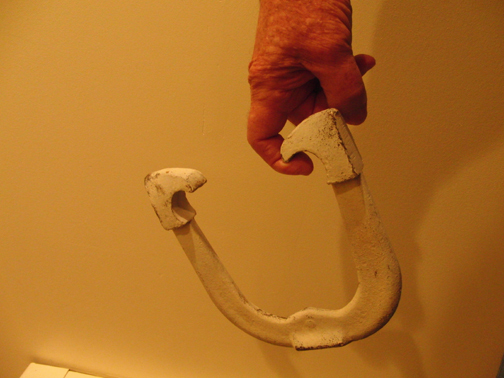 The ring and little finger adds additional support on the underside of the hook. Photo 8 shows the grip from the backside. The stance for this method is fairly unique. First, the stance is stationary without any stride. The right foot is placed into the right corner of the left approach. The left foot is to the left of the right and slightly behind. Photo 9 below shows the foot positioning for this method. 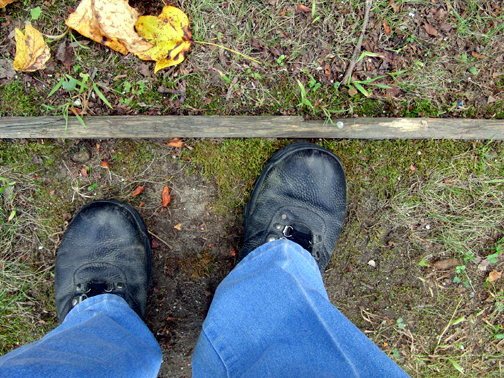 Photo 9 above shows the positioning of the left and right feet. 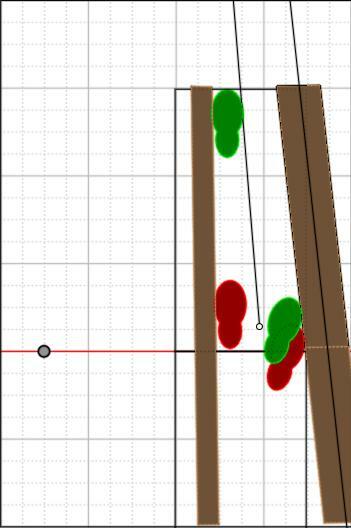 However, I’m showing this foot positioning on the 37 foot foul line. There is no platform for the 30 foot pitchers at this venue. Photo 10 shows my actual foot positioning at the 27 foot foul line. This is the 27 foot foul line. How do I know I’m at the right edge of the left approach? Look carefully, you’ll see the head of a nail in front of my right toe, nailed into the board. I put it there last year on each of the 27 foot foul line boards on 8 courts. I also nailed the right approach as well. If you are considering moving up to 30 feet, consider the condition of the courts you pitch on. It is very difficult, if not impossible, to setup constants on an approach when you don’t have a permanent one. This stance helps to deal with the lack of a permanent approach. Unfortunately, this is not unusual. Many horseshoe pitching facilities suffer from this lack of 30 foot platforms. Two years ago I pitched in the Maryland Senior Olympics at another location. There was no defined location for the 30 foot pitchers to pitch from. There was nothing. You did the best you could to pace off the 10 feet from the 37 foot foul line and try to visualize where the edges of the approach actually were located. I didn’t pitch at that facility the following year. Fortunately, it was relocated to the Elks facility on Kent Island, Maryland in 2014. Here is another left hand approach. The foul line disappears underground to the right. It made no sense to have a setup and delivery with a stride for permanent approaches, and one trying to find a setup and stride with the issues cited without an approach. So, based on these approach issues, I decided to go to the stationary stance without a stride for future pitching. Fortunately, it has become an improvement rather than a hindrance. From the stance above, I shift “all” of my weight to my right foot. With all of the weight on my right foot, my left foot is raised slightly, so the toe barely touches the ground. Every bit of weight is now resting on my right foot. This causes my body to naturally tilt to the right, placing my head very close to looking straight down the line. While practicing, I use the over and under cords, on and over the Line of Flight. I have found that I can fine tune my setup by moving my left foot forward or back depending on how my balance feels at setup. The address starts with the horseshoe resting against my right leg with a fully extended arm. My left arm is resting comfortably inside my left thigh. 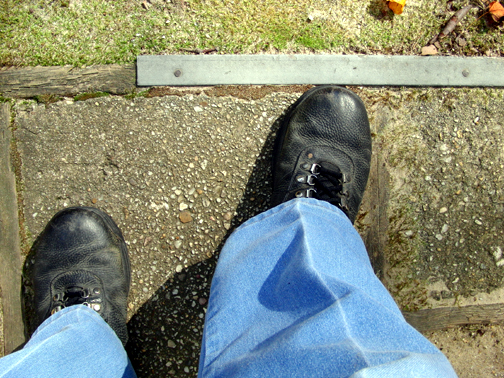 I swing up to my Visual Alignment Point (VAP). My VAP is correct when the left shank of the horseshoe is visually above the right edge of the stake and when my arm is horizontal to the ground. When I feel perfectly balanced on the my right foot/leg, I start the downswing, and tick my pant leg going by, and carry the horseshoe to my Back Swing Stop Point (where the horseshoe naturally stops it’s backward swing). I like to start my flip rotation as I begin my forward swing. I concentrate on a nice soft flight and landing, concentrating on maintaining my balance. It really surprises me that it is fairly easy to maintain my balance throughout the entire swing. 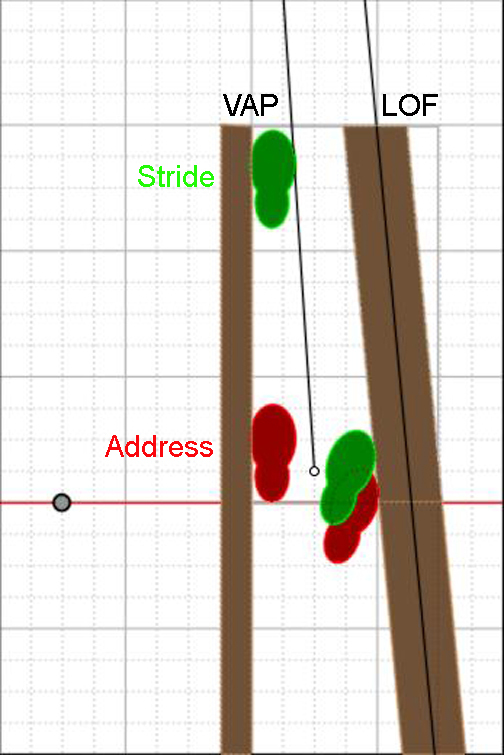 The technique is effective because it eliminates the cause of many misses…the stride. Think about all of the things that can go wrong when you are making a stride forward. For example, your arm swing, stride forward and foot plant are not synchronized; or, you move forward too slowly or quickly; or, you stride off line; or dip your head and release too low; or, allow your shoulder to rotate counter-clockwise when you step forward with the opposite leg. The no stride method can eliminate all of these potential problems. 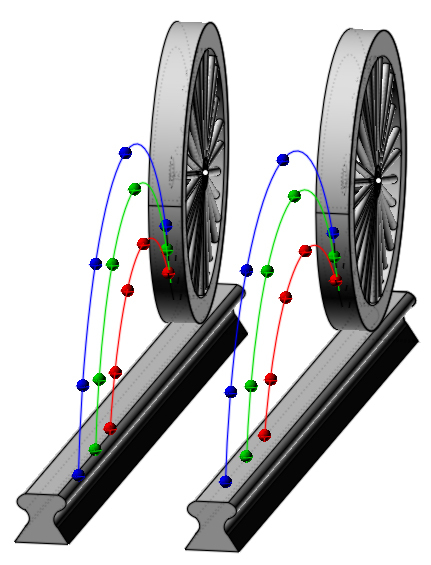 Furthermore, the stationary stance produces a circular swing arc without backward or forward movement. It couldn’t get simpler. If you are considering moving up to 30 feet, make sure you have plenty of other 30 foot pitchers to pitch against. If you intend to pitch in NHPA sanctioned tournaments, be aware of the tournament guidelines. The NHPA allows the Tournament Directors the right to set the rules for their local tournaments. If the TD’s set a no Class mixing policy, you may find you have no one to pitch against. This generally means that 30 foot Elder Class A pitchers cannot pitch against Class A 40 foot pitchers, regardless of ringer average. There are a number of informal clubs in my area that will not permit 30 foot pitchers of any kind, either male or female. Perhaps one day the NHPA will take a good hard look at the issue of 30 foot and 40 foot pitchers competing. It is an issue that needs to be solved for the sake of horseshoe pitching in general. The horseshoe court images I presented earlier are indicative of the challenges you may face when moving up. Keep in mind, the method I’ve described gives you an option for overcoming poor pit conditions and also gives you an opportunity to improve your ringer average. Eliminating the stride converts one more major variable to a constant. Actually, there are a number of potential errors committed during the stride and release that are eliminated with the stationary stance. I’m looking forward to the 2015 pitching season. The following paragraphs are page 1 of the PDF file linked below entitled “Down the Line”. I decided that I wanted to put together a topic that had all information in one place. So, the PDF has all information included and does not require you refer to a previously discussed topic. If you select the URL below you will be able to read the file online, but, you can also download the PDF to your own system and print it out if interested. It is 20 pages that describes a unique method of pitching. The right hand approach for right handed pitchers is recommended over the left approach. This is primarily due to the setup requirement of this method. Please feel free to contact me if you require any clarification of this method. The following information is page 1 of the PDF. What does it mean “Down the Line”? If you were asked to point at an object in the distance, the tip of your finger would align with your eyes to the object. However, if someone standing behind you looked down your arm, you would actually be pointing well left of the object. This variable exists because your eyes and arm are about 10-11 inches from your nose. There is always “that angle” between the eyes, arm and object. You must mentally make the adjustment to account for the angle “Off the Line”. To be “Down the Line” means that at setup, your eyes, shoulder, arm and horseshoe are in line and vertically over the Line of Flight (LOF). Further, when delivered, the horseshoe follows the LOF under your eyes and directly at the stake. Is that actually possible? Yes! With the proper stance and body alignment, you can actually pitch directly at what you’re looking at. There is no angle to consider. So, if you pointed your finger at an object with the proper setup, anyone standing behind you would see your pointing finger and arm are actually pointing directly at the object. In this case, the stake. The remainder of this process of “Down the Line”, is how to achieve this setup, stride forward and delivery of the horseshoe directly over the LOF and under your eyes to the stake. The process begins by setting up a few props to help insure that your body is positioned properly and your eyes/head accurately move directly at the stake. Below is a photo of the 4 props necessary to setup your pit properly. Substitute as necessary, but, replace with an equivalent prop. This technique uses the RIGHT approach. https://app.box.com/s/h84jw77pfb1zbour84yg “Down the Line” NOTE: This is a new URL created on 8 September. Your previous URL will not now work. Further editing will be added to Part 49. I just wanted to get it out quickly. The information that appears in this part has been discussed before, but, scattered throughout various parts. I am presenting the consolidation of the information in one place due to it’s importance in your enjoyment of horseshoe pitching. Nothing can be more frustrating than beating your opponent with ringers and losing because of lost single points. So, I’m cautioning you now, if you pitch against a turn pitcher and you’re a flip pitcher and you are of equal ringer averages, you will lose points to the turn pitcher, unless you pay attention to Drop Angle. It is my opinion that, Drop Angle is the most important aspect of horseshoe pitching. Unfortunately, it’s the aspect most ignored. However, it will determine whether you are a successful horseshoe pitcher or not. Why? You will tend to develop bad habits that will be difficult to correct later. Advice to the new pitcher — work on Drop Angle first. Advice to the experienced pitcher — work to improve it. 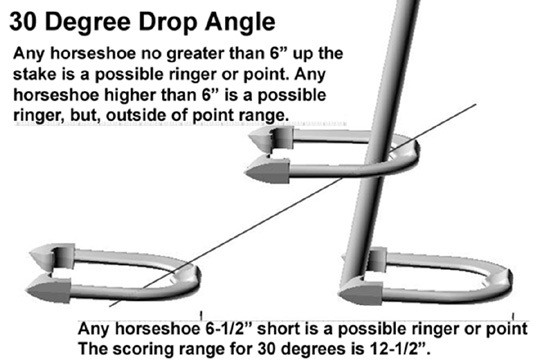 Drop Angle can determine if you receive a point for closest to the stake, how softly the horseshoe arrives, whether your shoe is rejected at the stake, and how the pit material effects results. If you are a flip pitcher, the Drop Angle is even more important to save those all important single points. If you are a beginning horseshoe pitcher, this aspect of pitching should be the aspect of most importance, whether you’re flipping or turning. It is my goal in this part to convince you that, proper Drop Angle, is the key to success whether flipping or turning. Once you have perfected your Drop Angle, you can make the necessary grip adjustments to have the shoe arrive open either as flipped or turned. If you start out as a flipper and throw the shoe low and hard you will forever have problems with perfectly thrown ringers that are rejected and bounce back. If pitching in sand, you will constantly face shoes that slide all the way to the backstop. 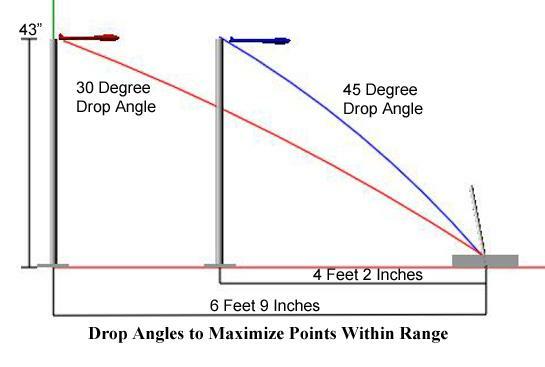 What is Meant by Drop Angle? It is the angle of arrival of a falling object during the last few feet of travel and is relative to the horizontal plane. If you Drop a horseshoe or any other object onto a horizontal surface, the Drop Angle would be 90 degrees. If you were to toss the horseshoe or object onto a horizontal surface, the Drop Angle would be less than 90 degrees. Keep in mind that the lower the angle of arrival, the more the horseshoe or object would want to slide, very little in clay and much more in sand/dirt. Most beginning horseshoe pitchers will begin pitching in sand or dirt or even gravel. It is easy to develop the bad habit of sliding horseshoes in to the stake, pitching the horseshoe very low and with excessive speed. All bad habits and difficult to correct. You only need to pitch in your first NHPA sanctioned tournament with clay as pit material, to realize that your technique won’t work if you’ve not paid attention to Drop Angle. It is better to start out properly and develop a style that can be used in any pit material. That is why Drop Angle is so important. The graph and banner at the top of this part, shows the flight of a horseshoe from release to landing. The plot points define the location of the center of gravity of the horseshoe. It represents a single example of a horseshoe released 25.5 feet from the stake and 3 feet off the ground and reaching a highpoint at 6.75 feet. The gaps between points represents the travel of the horseshoe every 1/100 of a second. Note that the gap is very close together as the horseshoe slows down as it reaches the top of it’s flight. Also note that as the horseshoe begins to Drop toward the stake, the gap widens as the horseshoe increases it’s speed as it drops. Points — If you are pitching in a match where points are recorded, it is important to use a pitching technique that gives you the best opportunity to accumulate those single points. Keep in mind that a single point can determine a win or loss. Proper Drop Angle is the key. 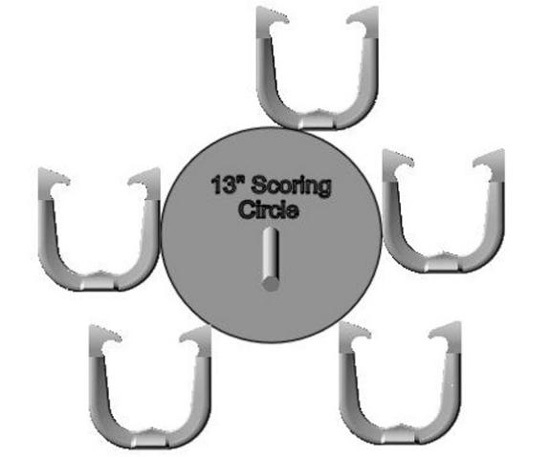 To secure a single point you must first keep your horseshoe in the scoring circle. See below. The scoring circle is a circle 13″ in diameter around the stake that is within the 6″ limit of a point. 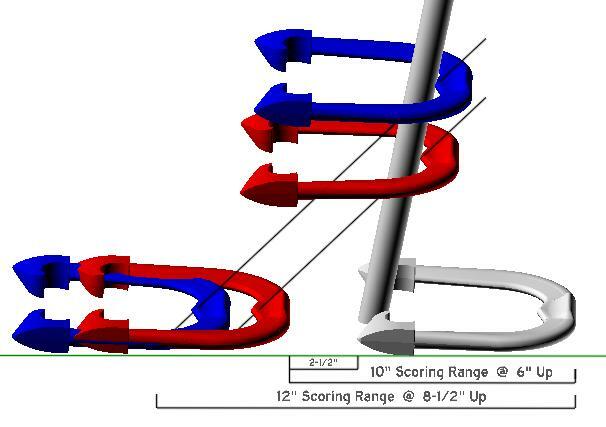 Any horseshoe touching or within the scoring circle is a potential point. The fact is, a horseshoe pitcher using the turn style of pitching will most often be within the scoring circle on every horseshoe pitched. For the flip pitcher, proper Drop Angle will determine if your horseshoe has the best chance of remaining in the scoring circle. Consider this — If you are a 50% ringer average pitcher, that means half of your horseshoes thrown are ringers…what about the other 50% that weren’t? What if you pitched a 50 shoe match and threw 25 ringers, how many of the remaining 25 shoes were winning points? If you decide you want to be a flip pitcher, you better spend equal time working on single points as you do on ringers. Soft Landing — A horseshoe that comes in from the proper height and Drop Angle tends to arrive more softly at the stake. When a shoe arrives at the stake properly it actually has a different sound when it lands. It is very odd, but, you’ll recognize the difference in sound immediately. I can only assume it is the sound of the shoe sliding down the stake at impact as opposed to the sound of a lower arriving shoe and more direct impact. You will experience the added benefit of fewer rejections or bounce back when the shoe arrives. Scoring Points — As previously mentioned. A shoe that arrives from the proper Drop Angle has the best chance of staying in the scoring circle and picking up points. The proper Drop Angle is a shoe arriving between 30 and 45 degrees. The calculation is based on a location no higher than 6″ on the stake. The two images below represent the value of shoes arriving at a minimum of 30 degrees and a maximum of 45 degrees. It is a fact that a shoe thrown at a 45 degree launch angle will carry the farthest with the least amount of effort. If you want to prove this fact, test it with your garden hose next time you’re watering. The force of the water in the hose will not change, but, the maximum distance the water will travel is when the hose is aimed up at a 45 degree angle. 45 degrees is the maximum. If you increase the launch angle the water will fall shorter than at a 45 degree launch angle. IT is accepted that no matter what you throw, it will travel it’s maximum distance if launched at 45 degrees. NOTE: — The previous paragraph provides a clue to situations where you or your opponent has left a horseshoe braced against the front of the stake. One way to clear that horseshoe is to increase your launch angle by simply releasing the shoe just a little later in your release. You don’t have to increase your effort to carry the shoe a bit further, just increase your launch angle by releasing the shoe later. It is a fact that you can throw your shoe further by applying the same effort as normal, but, releasing later. The tendency is to throw the shoe harder to carry it further. This is not necessary, simply releasing a little later will accomplish the same results without increasing your effort, or, raise the hub (shoulder) of your swing to do the same thing. The two images below represent the value of shoes arriving with a Drop Angle of 30 degrees and 45 degrees. To see larger images of each, select the image and double click. The image immediately below shows the horseshoe arriving at a Drop Angle of 30 degrees and the horseshoe remaining within the scoring circle if arriving 6″ up the stake. The image below represents the Drop Angle of 45 degrees. Compared to the 30 Degree Drop image, the horseshoe lands closer to the stake and can hit the stake much higher and still remain in the scoring circle. Below are two excellent teaching aids that will help develop the proper Drop Angle while practicing. The first is a 15″ used tire that can be placed around the stake. The goal is to drop the shoe into the tire without hitting the sidewall as it arrives. I also removed the sidewall on the bottom of the tire to keep from collecting water and cut a notch large enough to see the base of the stake from the approach. Also below is an image of a tamper which has a 8″x8″ base and is 44″ high. Positioning the tamper as indicated, relative to the stake is an excellent aid to be placed on your Line of Flight at the distance indicated to practice direction and Drop Angle control. You can keep the tire in the pit as an additional aid. Using either or both of these aids will help get the feel for developing the proper Drop Angle to salvage those all important single points, promote a soft landing and reduce those perfect ringers that bounce back off the stake. 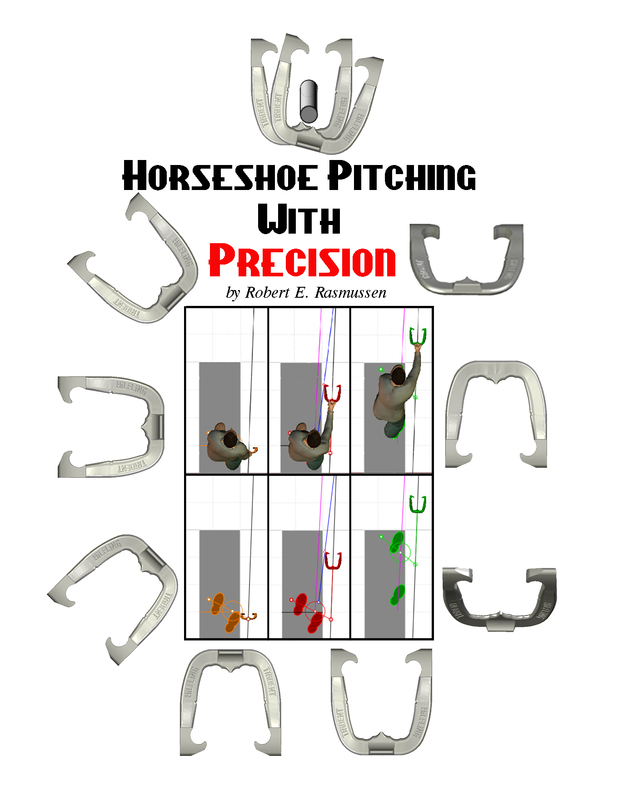 The Book entitled “Horseshoe Pitching With Precision” is now an EBook on Amazon. They have chosen to include the first 3 HTML files of the book as an introduction to its’ contents. I’ve chosen to duplicate the information for you the viewer of my blog. Part 45 introduced you to 5 pages from the printed spiral bound book selling on “The Book Patch”. The Cover for both the EBook and spiral bound printed book is shown above. The contents of the first 3 HTML files from the EBook follows. Amazon — formatted for the Kindle line of eReaders. LINK==> Kindle eReader. Available for purchase now at $5.99. eBookIt.com — provides EPUB and MOBI formats downloaded to your device. LINK==> eBookIt.com. Available now. Apple’s iBookstore — formatted for the iPad and iPhone with Table of Contents. Available for purchase after 1 September. Kobo — For the Canadian pitchers formatted for the Kobo eReader. LINK==> Kobo Books. Available now. Barnes and Noble — formatted for the NOOK. ReaderStore — formatted for the Sony eReader. LINK==> Sony eReader. Available for purchase after 15 September. Google ebookstore — formatted for the Google Nexus. LINK==> Nexus. Available now. This is written from the perspective of a relatively new pitcher, i.e. I began pitching in August of 2010. Not being overly pleased with my pitching, I searched for information that would help me to develop some degree of proficiency. To my surprise there was almost nothing available to help a beginner. By the close of my first year I’d accumulated no less than fourteen pair of horseshoes and had tried most every conceivable pitching technique possible from the input of well-meaning experienced pitchers. In the tournaments I began to develop some degree of proficiency, but nowhere near my expectations. I began to develop a bit of a love/hate relationship with the game. When things were going well, I loved the game. When things were not going well, I found myself becoming frustrated. Not just because I was not pitching well, but because I did not know “Why” I was not pitching well. In my continued search for information I ran across http://www.hilflinghorseshoes.com (Horseshoes My Way) on the Internet. 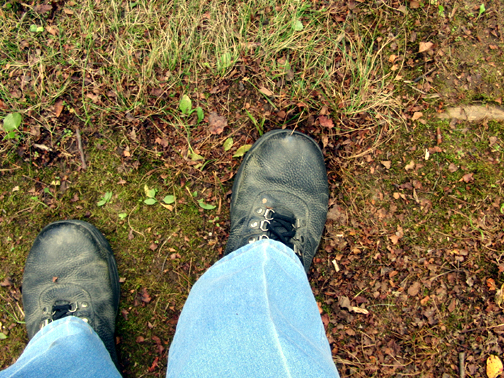 Unbeknown to myself at the time, I had found the place whereby I could eventually know “Why” the shoe went where it did, and thereby have an idea of how to correct an errant shoe. Within the pages of this short book you’ll find information that will help you to improve your game and thereby find even more enjoyment in the game. There are ideas on training aids that will help you to troubleshoot and correct problems, as well as diagrams and text that will help you to better understand the mechanics of the game. You might say, “Well, I just pitch shoes for fun.” Great! But it’s more fun to be improving and it can be very frustrating to not pitch well and not know “Why”. I found that the more I understood “Why”, the less my frustration and the greater the enjoyment of the game. Understanding the content of this book and putting it into practice will not insure that you never have a “bad day”, but it can certainly help you to dig yourself out when things are not going well. I am thoroughly enjoying my new sport and the friendships that are now such a part of my enjoyment. This is not just a “pitch” for a book, but an opportunity for me to personally thank its’ author for the many hours and research he put into it. Dr. John R. Nay, Ph.D. This book began in the Fall of 2007. It started on my first night of horseshoe pitching when I scored a grand total of 18 points and 0 ringers for 3 games. 3 years later I had a 60% ringer average. 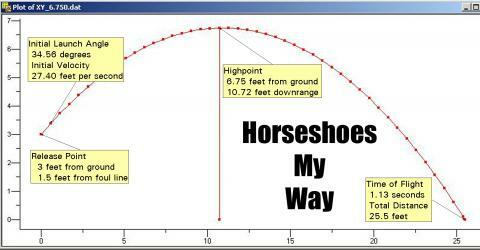 I also began a blog on WordPress to chronicle my search entitled, “Horseshoes My Way — The Search For My Perfect Swing” URL: http://www.hs-myway.com. To date, the blog contains 45 parts. This section makes 46. It’s taken six years to gather all of the information. It’s included hours of slow motion video (many now on YouTube), tournament competition in both NHPA and HP Pro Tour events, testing and refining, working in the 3D world, designing and producing horseshoes to improve the ringer average of the struggling horseshoe pitcher. It has all resulted in a spiral bound book I have entitled, “Horseshoe Pitching With Precision,” and this Ebook with the same name. It is my belief, “you cannot determine WHY you’ve missed, unless you know WHY you didn’t”. IF you’re willing to put in the time, this book will help you learn a precise way, and determine the “Why”. Developing a book for publication takes a huge amount of family time. So, I want to thank my wife and family for their unfailing support and continued encouragement. “How’s the book going?” meant they were in for a long discussion on something I was working on, and maybe a trip out to the pit for a little show and tell. 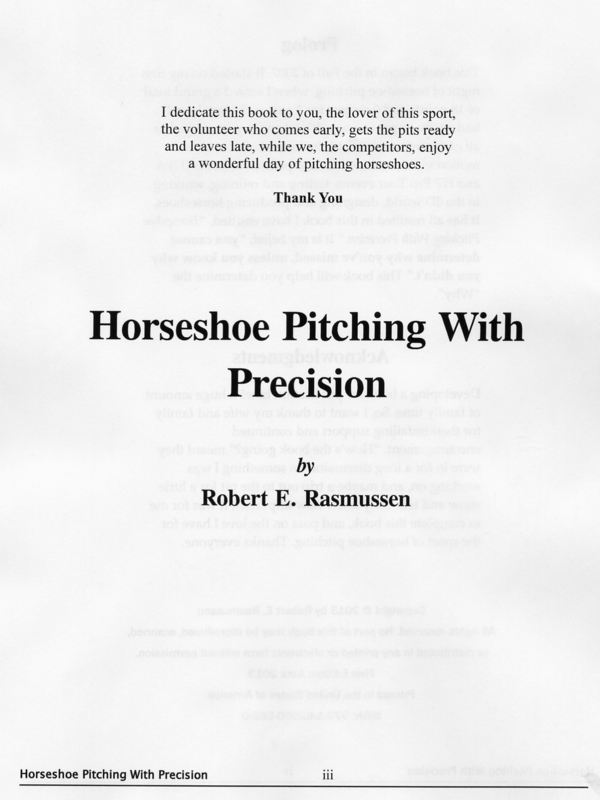 They knew how important it was for me to complete this book, and pass on the love I have for the sport of horseshoe pitching. Thanks everyone. All rights reserved. No part of this book may be reproduced, scanned, or distributed in any printed or electronic form without permission. 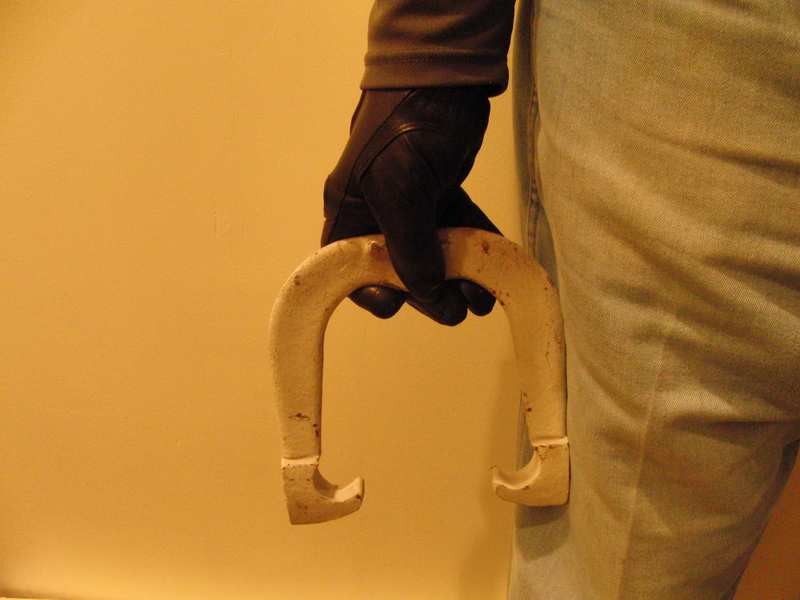 “I threw a horseshoe into the air, it came to earth, I knew precisely where.” Author, M.E. …when you grip a horseshoe to take your first pitch at a stake, every natural instinct you employ to accomplish that objective is wrong, absolutely wrong. I paraphrased a commonly stated comment by Ben Hogan above. I believe it is just as true for horseshoe pitchers. Many mistakes made early in their learning, are now part of their method. The book will cover several pitching methods in Section 1. However, every method will have a common theme, they all deal with constants, which are the keys to each method described. It is not a difficult concept. If you have ever bowled and stepped up on the approach and stood over a specific dot every time you took your stance, that dot was your constant. There are dots or constants on the horseshoe pitching platform as well, I’ll show you where and how to use them. So, in a nutshell, Constants are those values and positions that are absolute and unvarying. 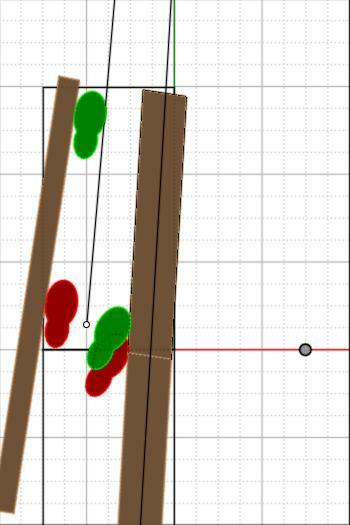 There is an image a little later called, Important Fixed Points that describes the location of all of the fixed points or constants, on the pitching platforms. Using constants in your method will help you determine why your arrival direction was off line. All terms mentioned, will be fully explained as you go. We will cover one of the most important aspects of these methods…the Visual Alignment Point (VAP). Without the Visual Alignment Point, you will never be certain that you are following the target line which is called the Line of Flight (LOF). It is the VAP and the Pendulum Swing that insures that your horseshoe from setup, address position, swing back and delivery, remains precisely over the Line of Flight from beginning to end. The VAP is a point in the distance that is a constant, that you can always refer to, when you address either stake. We will make sure, through examples, where the VAP is located and how to find it. It is so important, I will start Section 1 with a full explanation of what it is and how to find and use it. 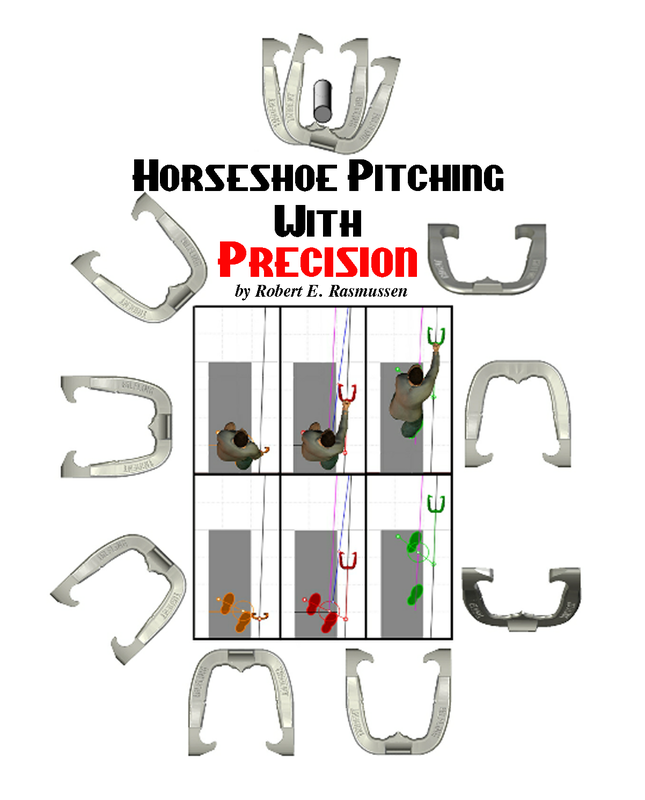 This book is a guide for beginning horseshoe pitchers, as well as the non-beginner. The information throughout this book pertains to right handed pitchers. If left handed, please reverse left to right and right to left (mirror image), that includes approaches. This book will prove that “you cannot correct what you’re doing wrong, unless you know what you’ve done right”. It is normally thought that you only need to deal with 3 aspects of horseshoe pitching, i.e., distance, direction and an open shoe at arrival. There are two additional and equally important considerations, drop angle and orientation of the arriving shoe. We will cover all 5. This book is divided into three separate sections. Section 0 – is for the horseshoe pitching beginner. It covers everything you need to know to get started such as horseshoes, turn vs flip, practice equipment, pit design, league play, tournaments, score keeping, etc. Section 1 – deals specifically with three methods of PITCHING and the necessary information needed to support these methods. The purpose of Section 1 is to describe the three pitching techniques that will permit you to troubleshoot your reason(s) for a directional miss. You’ll never have to say, “I don’t know what I’m doing wrong!”. Section 2 – deals with everything else horseshoe related. It will cover helping aids, practice methods, NHPA rules, horseshoes, grips, NHPA sanctioned tournaments, HP Pro Tour tournaments, drop angle, release point, court etiquette, emergency preparation, horseshoe design, high point, pitching grips, etc. This book was almost complete, when I realized that I’d lost sight of the very reason for writing this book. You….the Beginner. So, I’ve added Section 0. Section 0 will start at the absolute beginning of everything that a beginner might want to know about horseshoe pitching. I guess it’s fitting that I call it Section 0, as “0%” was my ringer average after my first night of pitching in 2007. In 2006 I was invited to join the American Legion. I decided to check out the local Legion posts and found that American Legion Post 7 in Crownsville, Maryland had a Winter billiards league and a Summer and Fall horseshoe league. Both sounded interesting, so, I joined the Summer of 2007. I was too late for the start of the Summer horseshoe league, but, notified the league director that I was interested in the Fall league. I didn’t have a partner, so, he’d find one for me. As a matter of fact, I didn’t know the first thing about horseshoe pitching, just the memory of the sound of horseshoes in the backyard in the 40’s. My Dad had put up lights and horseshoe pits for the neighbors to stop by for an evening of horseshoe pitching after supper. I actually have my Dads old horseshoes, but, thought they might be a bit outdated. The first pitching night arrived and I showed up to meet my partner. My new partner pitched “Mustangs”, so, that’s what we pitched. In 3 games, 108 horseshoes thrown, not one ringer. My ringer average after week 1…0%. This book is the result of that first night in 2007. Beginner or not, reading and understanding the Goals, is the road map to understanding the 3 Methods described in Section 1. Method 1 describes a technique that takes advantage of our natural tendencies to swing our arms inward toward center from the right approach only. Method 2 describes a technique that can be used anywhere on either approach, as long as you follow the geometry that permits it. Method 3 is directed to the pitcher who, for whatever reason, cannot stride forward. It describes a stationary stance taken at the foul line. Email me at bobrass@verizon.net. I welcome any questions about anything in this book or perhaps you just want a clarification about a particular topic. Please contact me. Your questions may help to improve later revisions. The goal of this book is to describe techniques that can be used to troubleshoot misses. “You will never know why you missed, unless you know precisely why you didn’t”. Doing everything precisely the same way every time, should be your goal. My goal is to define the steps that make it possible. No matter what your method is, whether one described in this book, or, one of your own, you will have limited success unless you learn to control the three body movements listed below. If you want to start with one, choose the Head. Your head is the heaviest part of your body and your eyes are attached to it. Controlling the head – is the most important aspect of pitching horseshoes. The head is the rudder that not only controls the direction, but, the distance traveled by a released horseshoe. The head controls the shoulder, the shoulder the arm, the arm the horseshoe. Move the head and the horseshoe will follow. Controlling shoulder rotation – uncontrolled shoulder rotation leads to misses left or right. As we walk, our shoulders naturally rotate inward toward center and toward the striding foot. Method 1 will take advantage of the rotation and Methods 2 and 3 will restrict your shoulder rotation. Controlling footwork – the exact placement of your feet (stance) on the approach will define your body alignment, stride direction, stride length, and balance during delivery. The geometry described in Section 1 began with identifying the 3 goals described above. Not one single line, arc, or circle was drawn until all 3 goals above were established first. The first consideration of the geometry was how to allow the head and eyes to move directly at the stake. This means that during the stride forward the head moves in a straight line to the stake. This is easily monitored in practice and competition. If you move your head in a straight line at the target you eliminate potential directional problems. If your head moves left or right you will take your swinging arm with it. You must learn to tame your shoulder rotation. In Method 1, we’ll use the tendency to rotate toward the striding leg, to your advantage. In Methods 2 and 3, we’ll restrict your shoulder rotation. The stance and body alignment, is based on a strong and balanced position at setup and permits the stride forward to end in a strong and balanced position. These positions are based on foot positions and body alignments based on classes I had taken in Aikido, and other martial arts. It was not until all three aspects mentioned above were satisfied, did the development of the geometry begin. There was one final consideration…the delivery of the horseshoe in a straight line from setup, address, back swing and release without deviation. Keeping the arm and shoulder in a vertical plane was required. Using the concept of a pendulum on a grandfather clock was chosen. It swings vertically, in a straight line back and forth, while attached to a non-bending shaft. 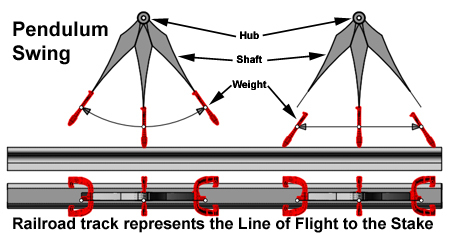 The concept of a straight Line of Flight (abbreviated LOF) along a vertical plane, was incorporated into the geometry. It is important to note that the methods described apply equally to a flipping or turning horseshoe. I am listing a series of Tips and Tricks at the beginning of this book to help you as you progress through your reading and testing. I’ve made no effort to determine an order of importance, they are only numbered for uniqueness. The links in the Introduction should have “introduced” you to the Visual Alignment Point (VAP), Line of Flight (LOF), and Pendulum Swing. 1. Keep a journal, both for practice and competition. Jot down anything you’re doing and how it’s working. Your journal will help to spot tendencies. Things that appear to be unimportant may later turn out to be helpful. 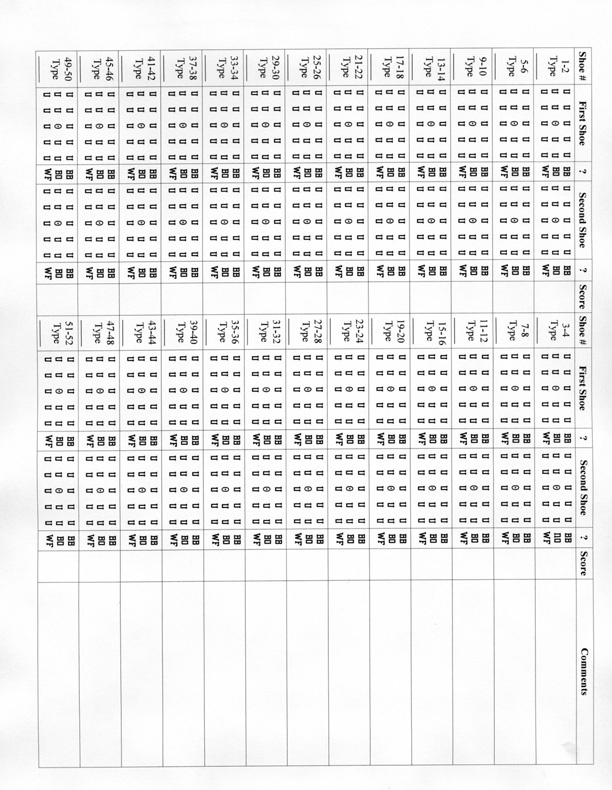 The back of this book has a form you can print, to monitor how your horseshoe is arriving at the stake during practice. Check it for tendencies. 2. Develop your own repeatable constants as you progress. For example, how and when you grip the shoe, move to the approach, your swing key, etc. Jot them down in your journal. 3. Concentrate on one thing at a time. For instance, if you’re working on the Line of Flight and you hit the stake. Don’t worry about whether it was a ringer or not. You can always adjust your grip to change the arrival. 4. Develop a mental rhythm or cadence. 1 and 2 and 3 and 4, for instance. The Skaters’ Waltz is the perfect music to demonstrate the rhythm and timing of your arm swing and release. Running the timing through your mind is the perfect method to eliminate distractions. 5. During practice and competition, concentrate visually on the bottom of the stake. Your brain has a way of telling your body how much effort to put into throwing something a particular distance. 6. Swing up the stake during your delivery. You are trying to follow a straight line, the Line of Flight, previously mentioned. Continuing up the stake insures that you are following it. 7. Relax. If tension creeps into your swing, all sorts of problems ensue. You won’t be able to take a full back swing, you’ll begin to rush, or start throwing at the stake, or lose your balance, etc. 8. Eliminate distractions. The best way is mentally repeating your cadence and locking your eyes on the bottom of the stake. One occupies your mind and the other your eyes. 9. The geometry in this book is based on your head and eyes moving in a straight line during the delivery. Wherever you’re pitching, pick a spot behind the stake or opposite approach and make sure your head and eyes maintain that relationship during your stride forward. 10. The geometry in this book is also based on the control of your shoulder rotation. Resting your left hand on your left thigh is a good monitor for controlling and monitoring rotation. 11. If a shoe is blocking your way to the stake. Raise your pitching shoulder and throw the shoe as normal. The timing of your release should not change, but, raising your shoulder will increase the height and the length of flight. This extra distance should allow the shoe to arrive above the blocking shoe. 12. Another method of increasing your distance when arriving short, is to try a bit firmer grip, or, a horseshoe with a little higher thumb calk, if you’re a flipper. Either should increase your distance by delaying your release slightly. Raising the shoulder was discussed earlier. 13. Practice by throwing into a 15” tire. It will help to eliminate low flights and hard arrivals. 14. If you develop your own list of Tips and Tricks, jot them down in your journal. Continue to Part 47 for a description of Method 4, a simple method of pitching from either approach. This is the title of my new book entitled, “Horseshoe Pitching With Precision”. It is printed 8-1/2″ x 11″ and spiral bound. It is slightly less than 100 pages. It is available now at TheBookPatch, a Print on Demand (POD) company. Their URL http://www.thebookpatch.com . As of 17 July the eReader versions were distributed to the various companies providing eReaders such as Amazon (Kindle), Barnes and Noble (Nook), iBookstore (Ipad/iPhone), Kobo, ReaderStore (Sony eReader), etc. See Part 46 for more information. 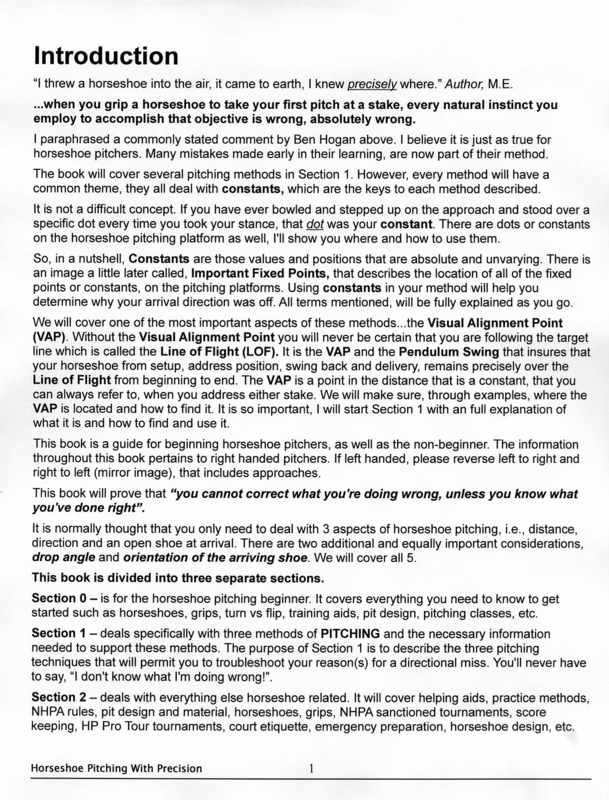 The book is designed to help both the beginner and non-beginner to take a look at their method of pitching from a little different perspective. It is divided into three distinct sections. Section 0 is for the new pitcher interested in horseshoe pitching. It covers building a pit and pit material, practicing, flip versus turn, joining a league, etc. Section 1 describes 3 unique ways to pitch horseshoes based on exact positioning. 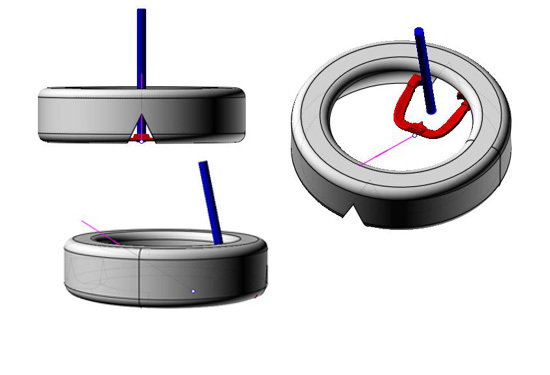 Section 3 covers everything else related to any aspect of horseshoe pitching, i.e., practicing, NHPA and HP Pro Tour events, various grips for the flip or turn, horseshoe design and production, score keeping, 3D printing, etc. For Section 1, I have broken down the act of pitching a horseshoe into individual pieces. Before I created a single arc, line, or circle geometrically, I looked at each phase of pitching a horseshoe. It is broken down into three phases. Phase 1 is the setup on the approach. Phase 2 is the address position. Phase 3 is the stride forward and release. It is first based on a strong, balanced setup that positions your body and shoulders properly. Secondly, establishing a Line of Flight that is precise and directly at the stake from the moment you take your stance until the horseshoe leaves your hand. Finally, your head, eyes and stride move directly at the stake. After establishing those 3 requirements, then the geometry was included to provide a pathway to satisfy those 3 requirements. How you grip and release the horseshoe is your choice. 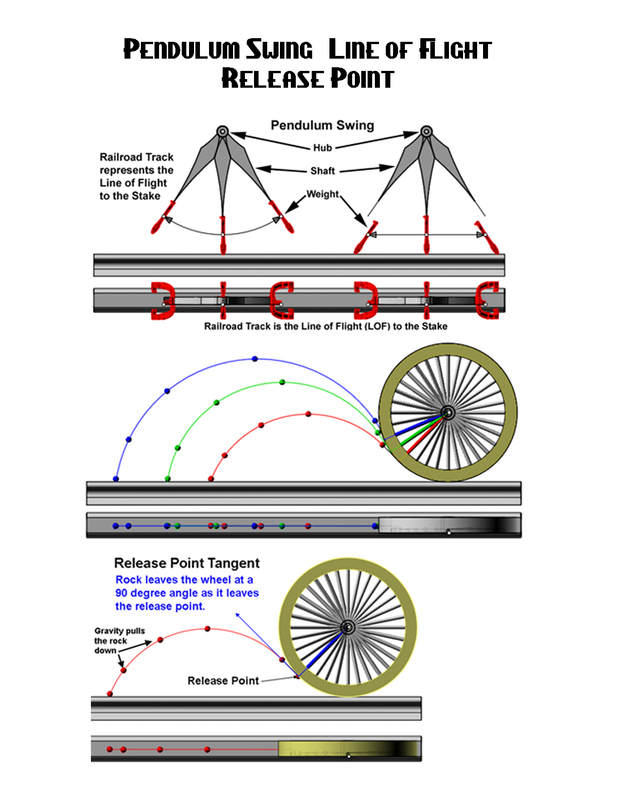 Whether you turn, flip, flip-turn or any other release technique, will not be affected by these methods. The book provides 3 different methods to achieve those goals. Method 1 takes advantage of your natural human tendencies to swing your arms inward toward the center of your body. There is no attempt to change it, only to take advantage of that tendency. Method 2 provides a method that will allow you to move the geometry to either approach and anywhere on either approach as long as you maintain the geometry properly. Method 3 is directed at those horseshoe pitchers who cannot stride because of a physical restriction, i.e., back or leg problems, or perhaps using a prosthesis, and need to stand at the foul line. 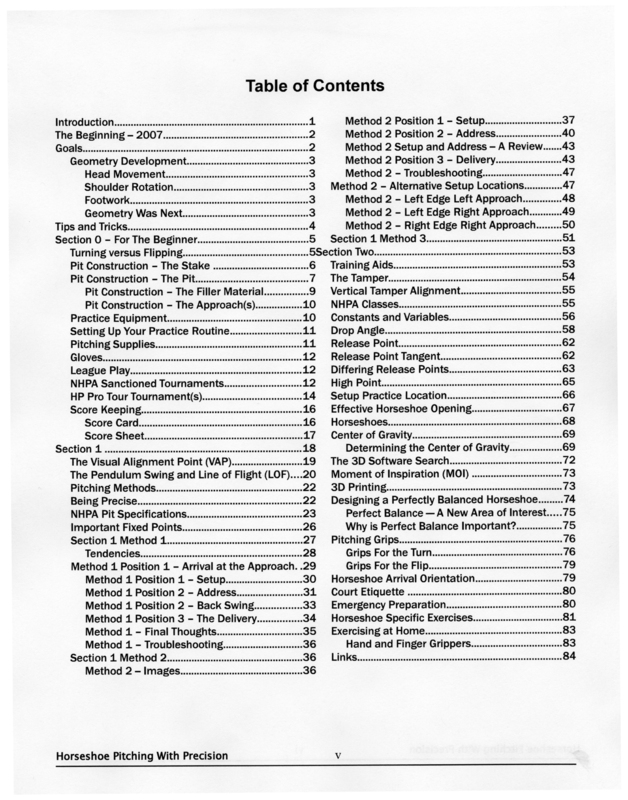 The purpose of this book is to standardize each aspect of your technique based on constants or fixed points established during each of the three phases mentioned and to provide the reasons for a miss. Using these methods will provide you with the information necessary to correct a directional problem. These methods will take the horseshoe directly at the stake. It is your release technique that determines if it’s open when it arrives. You cannot determine why you missed, unless you know why you didn’t. The key to the success of this method is repeatability. That means doing everything the same each time. It starts on the approach, and progresses to a precise address and a proper stride directly at the stake, while monitoring your shoulder positions. Double-click on any image for a larger presentation. Use the BUY NOW button below to check out the information on The Book Patch. There is no obligation to BUY NOW. Continue to Part 46 for a reproduction of the first few pages of information provided by Amazon for their Kindle version of Horseshoe Pitching With Precision. Other eReader companies and their versions, with availability, are referenced as well.